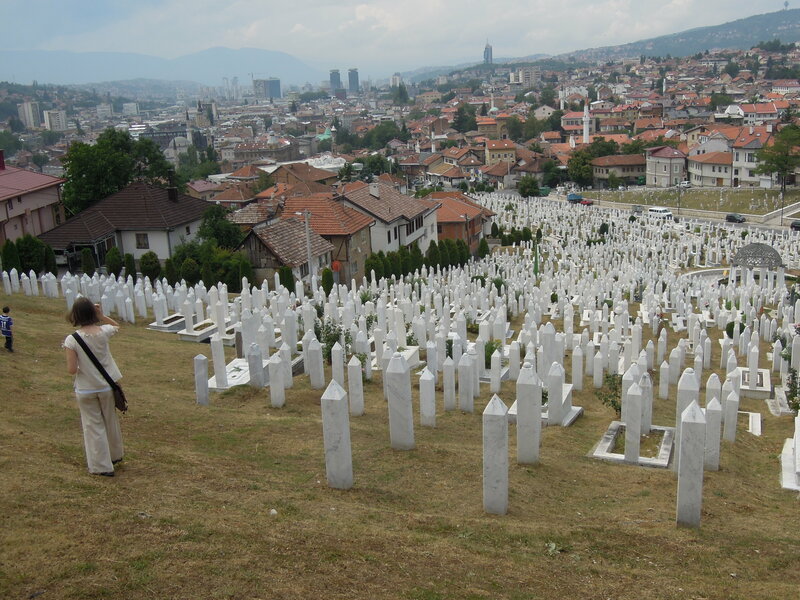 Sarajevo is a city that you need to pay attention to on so many levels. Look at the ground. You will notice places where damage to the streets has been repaired with red epoxy. These are the roses of Sarajevo, showing where lives ended during the siege. Look at the sky. It is filled with woodsmoke from bakeries and barbecues preparing flatbread and cevapcici for the evening post-Ramadan rush. Look at the buildings. You will see damage from shelling and sniper fire. You will see repaired buildings not yet painted and those completely restored. New condos and shiny new hotels. Graffiti pleading with people to forgive and forget and also never to forget. We encountered cemetery after cemetery full of stones dating between 1992 and 1996. The ages of the people who died were mixed (snipers weren’t picky), although most were born in the early 70’s and late 60’s. The right age to be outraged and to want to take back your city. We heard calls to prayer broadcasted all over the city at different times of the day. We saw women modestly dressed, wearing head scarves but not many fully covered. Most young women were smiling and shopping and looking modern. We jumped regularly when the cannon fired at 8:00 pm, signaling the end of the day’s fast. After that, the cafes and restaurants were packed with hungry people. We learned the hard way to seek out good restarants before this time. We travelled on the hot, crowded tram out to a park near the mountains, rented rusty, beat-up bikes and cycled out to the source of the river Bosna. We had to give the right of way to horses, which thrilled the boys. The river spring was pretty, but full of litter. The mountainside surrounding the park had been cleared of land mines several years ago, but cautioning signs were a sobering reminder of the past. In the old part of town, we used a public toilet which dates back to 1500 (the very first in Sarajevo). I was standing around with Jelena, waiting for Steve and the boys to come out, when Jelena noticed the plaque telling the story of the toilet. It was almost 500 years old when it was destroyed in the siege and was rebuilt 10 years ago. We happily shopped for clothing in the vibrant, touristy Turkish Quarter. We drank strong Turkish tea and coffee and nibbled soft Turkish delight. We were reminded over and over again that this was once a Turkish city, although always an oasis of religious tolerance…a meeting place of East and West. It still still proud of its heritage, although now wears the badge of being a survivor, too. Tomorrow we leave for Croatia and begin the non-city portion of our trip. I’m excited, but a little sad to be leaving Sarajevo. The car horns announcing the victory of Sarajevo over Bulgaria(football match) has finally come to a stop after more than an hour of exuberant honking. I’d better try to get a little sleep before our road trip tomorrow. Good night! Sorry you haven’t heard from us since your last postings I was having trouble sending for some reason. Today the clouds have returned and it’s looking like a grey weekend, boo. We are quite envious of you heading for Croatia, wish we were there to meet you. Dad is going to start painting the trim on the front of the house, we are waiting for the railings to come should be next week we hope. I have to do another 24 hr blood pressure collection on Monday sure hope there is an improvement. Keep your blogs coming it’s the highlight of our evenings!